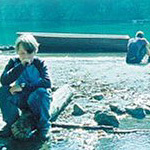 Mean Creek made a few top ten lists in 2004. Although I wouldn’t call it top-ten material, it is a very good American independent and a great debut for writer/director Jacob Aaron Estes. In a rural town in Oregon, a bully beats up another kid for touching his video camera. The kids are in 5th or 6th grade, so that’s not a surprise. Nor is what happens next. The victim’s older brother plans to get back at the bully by humiliating him. They’ll invite him out to the river on false pretenses. They’ll good-naturedly dare him to go skinny dipping. Then they’ll leave with his clothes. The older brother includes his friends in the scheme, and the younger brother invites a girl he likes. Add the bully, and they have a party of six on their rowboat of revenge. There is a major plot development that I will not reveal, although even without the development, the film would be just as good. What Mean Creek does best, and what makes it worth watching, has nothing to do with the story: it captures the way kids behave when out of sight of adults. Comparisons to Lord of the Flies are inevitable. Although Mean Creek doesn’t have the purity of drama that William Golding’s story has, what it does better is flesh out its Piggy. Piggy, if you recall, is the “scapegoat animal” in Lord of the Flies. He is the chubby kid that all the other boys pick on. The other boys have a mean streak, and they find a target in Piggy. In Mean Creek, that relationship is more dynamic. George (Josh Peck) is not only the “Piggy,” he’s also the bully from the beginning. At first we really hate him, but we do feel sorry that three older boys will be stepping in for the revenge. And when we get to know him, we vacillate even more wildly. Estes walks a very fine line between making George sympathetic and making you want to leave him naked in the woods. Boys can be cruel, but they are only human. Estes manages to pull fabulous performances from at least three members of his cast. In addition to Peck, Rory Culkin stands out as the central character, and Carly Schroeder, the only girl in the cast, has two or three scenes that are breathtaking. The only movie-related special features are a storyboard gallery (no surprises), and an audio commentary. The commentary track features seven people: the director, Peck, and Schroeder, along with editor Madeleine Gavin, director of photography Sharon Meir, and actors Trevor Morgan and Ryan Kelley. For such a large cast, the commentary is surprisingly sparse. Clearly, they are all in a studio together, watching the movie, and none of them seems particularly prepared. There is a lot of chitchat over minutiae. Carly points out a continuity error. Estes takes control and explains the decisions and serendipity found in the film. Just by chance, they did happen to answer two of my questions. One question they said they got asked a lot was whether all the emotional hurt in the performances sunk in through the skin. We know the answer has to be yes, which Peck admits, but he also says he can separate his portrayal of an unpopular, hurtful, and hurt character from reality. Another question they got came in response to three of the kids cutting themselves with a knife. All three use the same knife, and the camera shows it all in a single take. Estes explains that they were able to make three separate blood packs that didn’t all release at once. It’s just a trick, but a very convincing one. The heart of the film takes place on the creek, in daylight, and Meir’s Super 16mm cinematography looks great. The DVD presents the movie in widescreen, and sound is encoded in both 5.1 surround and 2.0 surround. Stacey and Will: Hi. We just watched Mean Creek and wondered if you ever found out from you animal rights activist friend if they did in fact kill a real snail in the movie. I hope not, but like you, am afraid they did for the reasons you mentioned. Please let us know if you ever found out or not.